Do you know which is the most diverse section of Indian cuisine? It’s none other than snacks and appetizers that range from street foods and sweets to homemade munchies to accompany tea and coffee. Each and every Indian state has its very own snacks influenced by its local cuisine. Although, snacks an appetizers are mainly served as starters in parties and gatherings before the initiation of the main meal, but in Gujarati and Andhra cuisine, snacks are served along with a main meal as well. 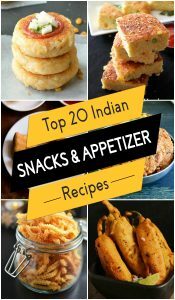 In this article, we bring to you a collection of 20 delicious and easy Indian snack recipes from different regions across India. Rice is a staple food of India and each and every state has its own way of preparing rice. But did you know that there are almost 40,000 varieties of rice? And these varieties differ in color, size and texture. 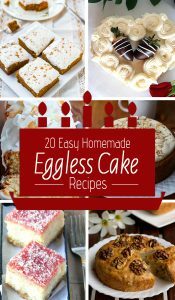 With such variety, no doubt it is one of the most versatile foods that can be prepared as a main dish, side dish, entrée and even dessert. Although, basic steamed rice served with some curry or side-dish is the most popular way to eat rice, but there are a variety of rice dishes that have originated in various parts of India and the recipes have been influenced by their own culinary style. 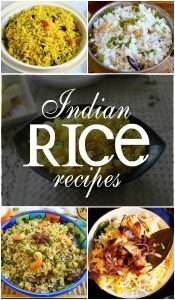 In this article, we bring to you 20 of the most popular rice recipes from all over India. Mushrooms are considered the new superfood in the health arena. But what’s so super about mushrooms? Well, other than being an extremely versatile ingredient, it is a potent source of Vitamin D and selenium, which are not found in most fruits and vegetables. It also contains a considerable amount of protein and fiber but zero fat. Mushrooms have long been used in continental cuisine, but it is making a strong place in Indian cuisine as well. Another intersecting thing about mushrooms is that you can prepare it in innumerable ways. You can grill, bake, sauté, stir fry, roast and roast them. 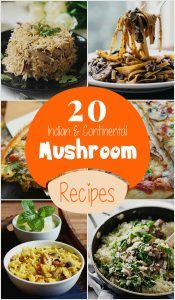 In this article, we bring to you a compilation of both Indian and Continental mushroom recipes that are easy to prepare and taste wonderful. Breakfast is not just the first meal of the day; it is by far the most important meal of the day that gives an instant energy boost to the body as well as the mind after a long over-night gap. Breakfast helps in boosting memory. The food you consume in the morning after a 8 to 9 hours long gap supplies energy to the brain and sharpens short term memory. And it is absolutely true that breakfast should be the biggest meal of the day, rather than lunch. This is because; whatever you eat at the start of the day will be burnt well throughout the day. If we look at the generalized Indian eating habit, we will see that we Indians never under-estimate the power of a wholesome and filling breakfast. A balanced Indian breakfast contains carbohydrates, protein and fiber with a small amount of fat. 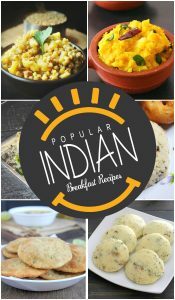 Common Indian breakfast recipes such as poha, upma, idli, dosa and paratha are packed with carbohydrates. The proteins come from curd, milk and lassi that accompany the breakfast. The oil, butter and ghee used to prepare and glaze these foods make up for the share of fats. In this article, we have enlisted 25 of the most popular Indian breakfast recipes from different states that are enjoyed all over the country. Paneer, also known as Cottage Cheese is a humble and versatile ingredient of Indian and South Asian cuisine and a favorite with Indians. 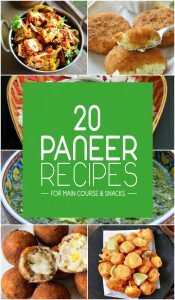 Indians love panner in all types of foods – curries, snacks, fires, sandwiches and even in desserts. Being a dairy product, it is a rich source of protein, calcium, phosphorus and healthy fats along with other vitamins and minerals that support healthy bones and teeth, boost growth and development and promote weight loss. In this article, we have shortlisted 20 of the most popular paneer recipes for main course and snacks that are enjoyed all over India as well as around the world. Do you have any idea which is the most widely consumed poultry product in the world? Yes, you guessed it right; it is none other than chicken. Chicken is a versatile white meat that can be cooked in whatever way you want – baked, boiled, fried, grilled, glazed, stewed, etc. And when it comes to Indian chicken recipes, the savory, spicy and flavorful curries, tandoori and tikka are famous all over the world. The two basic elements of Indian cuisine are spices and herbs and most of the Indian chicken curries make generous use of these aromatic spices and herbs thereby bringing out the best of the chicken. 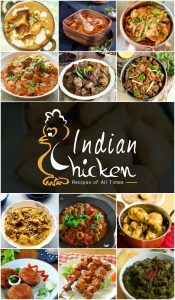 In this article, we present to you 20 flavorful and popular Indian chicken recipes suitable for main course, snacks and appetizers. Want to enhance the taste of a regular chicken or vegetable dish? Just cook it with some pasta and you have a marvelous dish at your dinner table. Pasta is the staple of Italian cuisine and it is cooked with almost anything and it still tastes amazing. The healthiest versions of pasta are made from durum wheat flour with is mixed with water or eggs. Pasta comes in a number of interesting shapes and varieties. Some of the most popular ones are Fusilli, Spaghetti, Fettuccine, Linguine, Penne, Farfalle and Tortellini. Whole grain pasta is a great source of complex carbohydrates and fiber that makes it a filling and wholesome food that helps to balance blood glucose levels and improves satiety. In this article, we have short listed 20 of the most delicious vegetarian and non-vegetarian pasta recipes which are true to the classic Italian cooking style. Don’t we love the taste of Veg fried rice that is served in our favourite Chinese restaurant? But most of us feel reluctant to prepare fired rice at our home because we think that it is too complicated or requires some rare oriental ingredients. 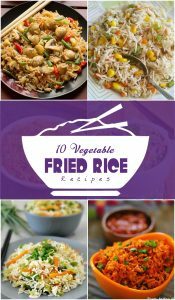 well, in this article we are about to change your perspective and present to you not 1 but 10 amazing and delicious vegetable fried rice recipes that you can prepare in your home without any hassle. Fired rice is a Chinese dish comprising of steamed and stir-fried rice mixed with vegetables, sauces and spices. Being an extremely versatile dish it is very popular in India as well as the rest of the world – including U.S.A, United Kingdom and Western African nations. Breakfast salads are the latest trend with health conscious people. But have you wondered why this trend has become so popular? Well, practically speaking, a hearty salad packed with vegetables, fruits, nuts, eggs, bacon and legumes is a much better option compared to a bowl of sugar-laden breakfast cereal or a cup of flavored yogurt. A salad not only helps to keep you satiated till lunch, but also packs in a wholesome serving of fruits and veggies right at the beginning of the day. 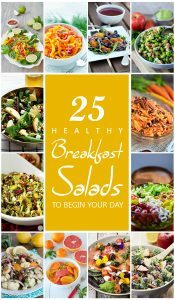 And by salad we don’t mean a plate of cold lettuce, the 25 delicious breakfast salad recipes provided in this article are extremely appetizing and flavorful and can be enjoyed by the whole family.